There is a lost glamour in air travel. Train cases have been replaced with plastic baggies, and the likelihood that luggage will be lost leads to over-stuffing a carry-on. While practicality trumps luxury when it comes to pre- and post-takeoff preparations, the miracle of flight can be restored with one small indulgence: an expert in-flight beauty routine. 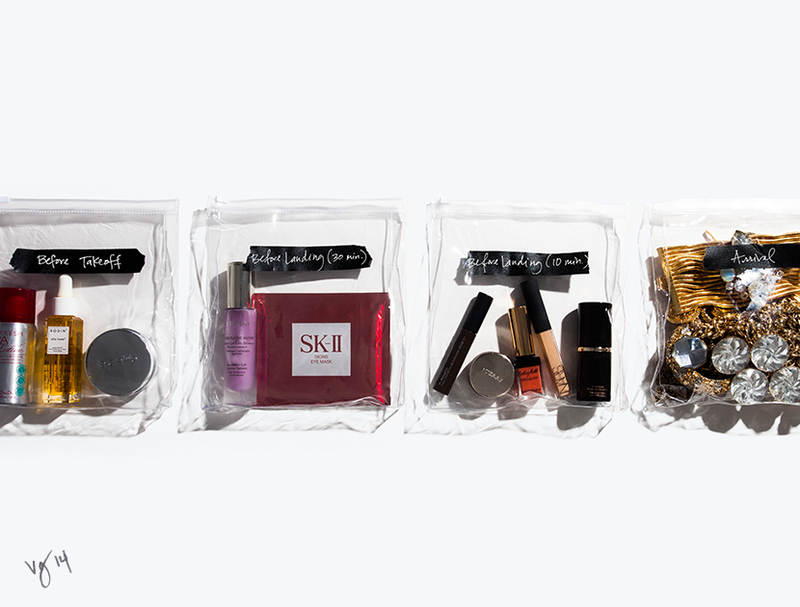 From VIOLET GREY’s file The Ultimate Airplane Beauty Routine comes the strategy makeup artist Mélanie Inglessis swears by for herself and her clients like Olivia Wilde, Kate Hudson, Rosamund Pike and Cameron Diaz. The products necessary to ensure an arrival suited for paparazzi flashes and straight-from-the-airport engagements, below. Everyone wants to walk off of a plane feeling healthy, glowing and rested — which is very hard to do after spending hours in the air! A jet-setting makeup artist shares her tried-and-true strategy for arriving fresh-faced after a long-haul flight.